I was really excited on Thursday because I got a prize that I won for blogging about Dove in the mail. It was a super luxurious Dove bath robe and a full sized bottle of Dove Nutrium body wash. The robe is super luxurious, but it has one major problem, it's white. I don't own white things because generally they are kid stain magnets. But I'd just received the Dreft to go stain remover pen, so I thought that I'd better give my white robe a try. And try it did. Within 30 minutes of putting on the robe I kid you not Tristan fell off the couch and bloodied his lip and got blood all over my super fancy robe. Yikes. Blood is one of those substances that is not easy to get out by any means. I pulled out the Dreft pen and hoped for the best but expected the worst. The Dreft pen has a couple of features, the stain removing liquid and then the pen also has teeth to scrub out the stain. I put it to work and magically, I was able to get the blood out of the robe. I have to say that I was seriously impressed! I may even get crazy and buy a white shirt! But I'd better not get too ahead of myself. 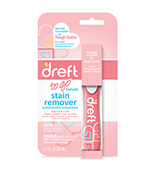 I definitely suggest the Dreft pen for removing stains. NOTE: I received the Dreft pen for free, but the opinions are my own!